Dr. Brian Matthew Jordan, cultural historian of the Civil War and Reconstruction, will speak at the close of the Civil War Sesquicentennial on April 16th at the next Drayton Hall Distinguished Speakers Series. The event comes 150 years and two days after April 14, 1865, when the United States flag was once again raised over Fort Sumter, marking the effective end of the war in Charleston. Jordan’s presentation, “Marching Home: Union and Confederate Veterans and Their Unending Civil War,” will discuss the lives of Civil War soldiers—both Union and Confederate—after the war as they returned to civilian life. For the men who fought it, the Civil War did not end at Appomattox. Civil War veterans wrestled with the meaning of their participation in the nation’s defining conflict for the rest of their lives. “My research and book mainly deals with Union veterans, but for the Drayton Hall Distinguished Speakers Series I will be weaving in stories from Confederate veterans in Charleston,” said Jordan. An interesting component of his presentation will be a discussion of the beliefs and actions of Drayton family members, before and after the war, and the mysteries still lingering today. Jordan is currently a professor of Civil War Era Studies at Gettysburg College. He holds a Ph.D. in History from Yale University, and his dissertation earned both the George Washington Egleston Prize and the John Addison Porter Prize. 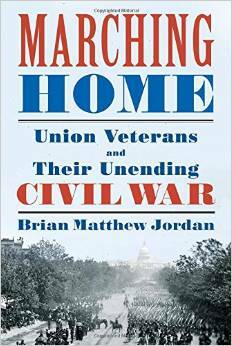 The author of numerous articles, essays, and reviews in scholarly journals and popular magazines, his most recent book is Marching Home: Union Veterans and Their Unending Civil War. The Drayton Hall Distinguished Speakers Series is held on Thursday nights at South Carolina Society Hall, 72 Meeting Street. Doors open at 5:30 pm with a wine and cheese reception, with presentations starting promptly at 6:30 pm. Presented by the Friends of Drayton Hall, admission is free and no advance reservations are necessary. The 2015 Distinguished Speakers Series is sponsored by Richard and Jill Almeida, the Francis Marion Hotel, and the Chipstone Foundation. For other questions and sponsorship inquiries please contact Tara White, development events coordinator, at 843-769-2627 or twhite@draytonhall.org.